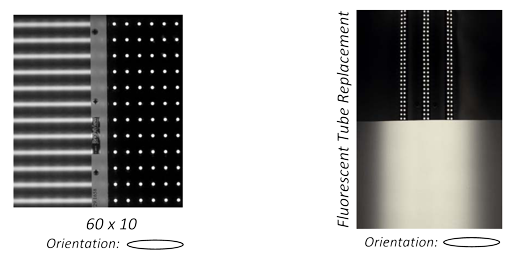 Utilising Bright View’s innovative Microstructure technology, the E Series product give elliptic light control, for high light transmission and excellent lamp obscuration. E-Series elliptical diffusers spread asymmetrically – more strongly in one direction than the other. They are used to diffuse a line of LEDs into a smooth line or to blend adjacent fluorescent lamps. They are also used to provide optimum spreading in wall-wash, linear, and cove applications. Bright View’s unique design causes less scalloping than other approaches, giving a smoother visual result.